You’ve just spent the last year working on honing your skills through the Data Analysis program. You dutifully spent your evenings — sometimes late into the night — on homework and projects, ignoring friends, family, and the ever-growing mountain of laundry in the corner. You coded hobby projects for your local municipality and wrote up an entire epic (at least, you thought it was epic) series of blog posts on your findings. And when a friend mentions her department’s struggling marketing efforts, your mind spins away on ways you might capture meaningful data and process the results. Now you want to get a job. Which, despite your best efforts as a data analyst, depends almost entirely on acing the interview. It should come as no surprise that careful preparation, and understanding the expectations going into the process, is what it takes not only to survive an interview for a data analyst position, but to set yourself apart as the best and most qualified candidate. And even if you’re not actively looking for a position — if you’re still learning your craft and working your way through your projects — you can get started right now practicing interview questions, so that in six or twelve months, you’ll have done all the legwork necessary to wow your potential employers and win that coveted dream job offer. What do you think a data scientist is/does? What do you think are the most important skills for a data scientist to have? Thoughtfully crafted answers demonstrate not only your interest and commitment to a career in data, but your communication skills as well. Keep in mind that you may be interviewed by a team lead or HR director without a technical background, in which case you want to be able to explain concepts in the most general terms. Which machine learning model (classification vs. regression, for example) to use given a particular problem. The tradeoffs between different types of classification models. Between different types of regression models. How to go about training, testing, and validating results. Different ways of controlling for model complexity. How to model a quantity that you can’t directly observe (using Bayesian approaches, for example, and when doing so, how to choose prior distributions). The various numerical optimization techniques (maximum likelihood, maximum a posteriori). What types of data are important for a particular set of business needs, how you would go about collecting that data. Dealing with correlated features in your data set, how to reduce the dimensionality of data. If you find yourself stumped on a question, don’t panic. It’s OK to ask for more context or a relevant example. But be prepared to talk theory as well. You need to know the field inside out to advance in it. Being able to talk fluently and confidently across the range of tools and methods of data analysis means a fair amount of study beforehand. You might find it useful to review your coursework and notes, and to go over the latest tech blogs and industry newsletters. and keeping up with Data Science Weekly and Machine Learning Mastery, as well as sharpening his skills through Hacker Rank and Kaggle Competitions. Reviewing your past work, and continuing to hone and use those skills, can only help ground you more thoroughly in the material. Undoubtedly, you’ll be asked to go into some detail about a project you’ve worked on. As Katie Malone says, prospective employers always ask these questions. Why you chose the model you did, given the problem you were trying to solve. What the features of your data were. How you tested and validated the results. What you got out of the project. When you get a new data set, what do you do with it to see if it will suit your needs for a given project? How do you handle big data sets — how would you start work on a project with an associated data set that was many tens of GB or larger? In addition to knowledge and skill, employers are looking for individuals who will be a good fit with the company and its culture. It goes without saying that you need to do what you can to research the company you’re interviewing with, looking not only at their products, but finding out what you can about their office culture as well. Think about a few reasons (other than a steady paycheck!) you’d like to work there. What data would you go after to start working on it? 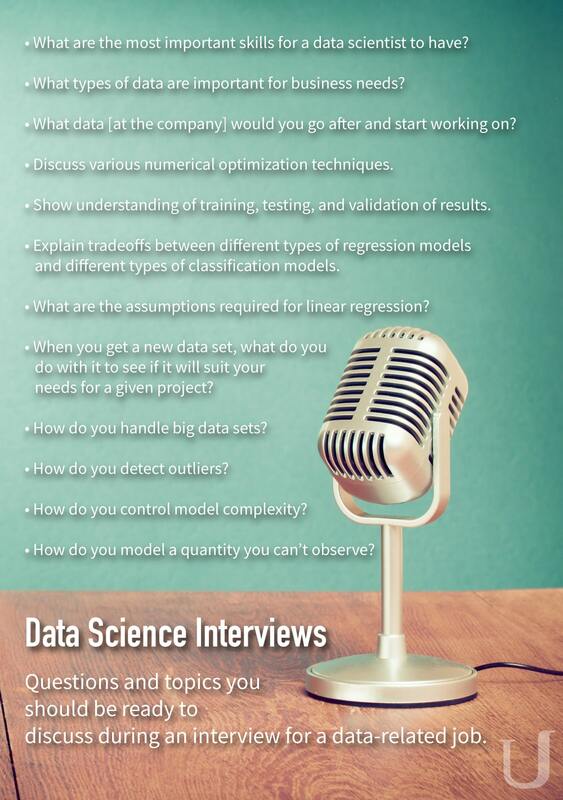 Going through lists of questions typically heard during data science interviews by yourself won’t be as effective as talking through a few of these problems with a friend or fellow student. Mock interviews give you practice not only in organizing and verbalising your thoughts, but in doing so under some degree of pressure (though prepare yourself for the possibility of an anxiety-ridden interview!). Reach out to your connections in the field and ask them how their own interview processes went and what they would ask if they were looking for a right-fit data analyst with your particular skill set. Lewis Kaneshiro is a former Udacity instructor and current data scientist at Shazam. Not only has he endured grueling interviews, he is also interviewing KPCB Fellows for summer internships. When looking for stand-out candidates, Lewis asks, What are the assumptions required for linear regression? Being able to confidently and capably verbalize and demonstrate (via a whiteboard) those assumptions has been a large chunk of Lewis’s interview experiences. He also hints at the importance of including graphical demonstrations of data that will violate each assumption. Lewis emphasizes that a keen interest in data, curiosity, drive, and tenacity are critical to convey during an interview. “I’ve found that interest and passion coupled with underlying curiosity and intellectual grit trump simple ‘brilliance’ or ‘intelligence’ every time. We’ve passed on PhD candidates that are pure intellectuals in favor of passionate masters or undergrads willing to dive into data and get dirty. 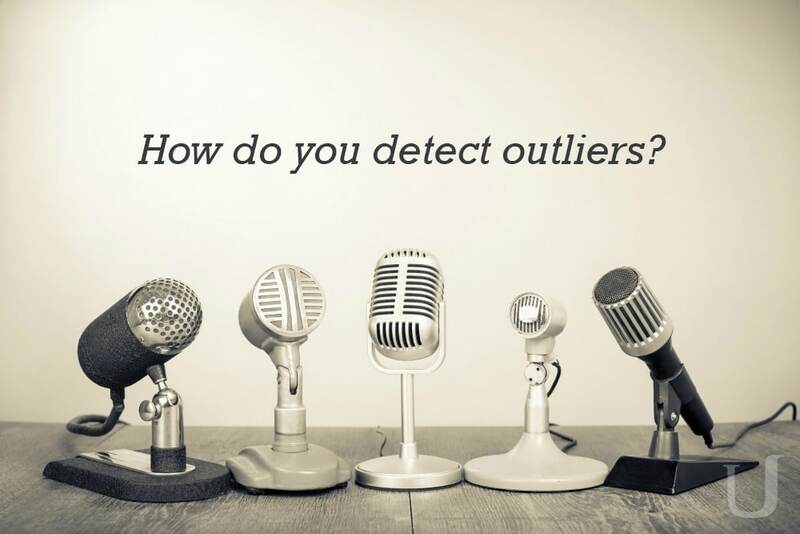 And finally, Lewis wants to know of those he interviews, how do you detect outliers? If you were to ask a hundred different data professionals what they were asked during their interviews, you’d likely get a hundred different answers. Luckily, you don’t have to collate that information yourself. There are tons of lists and resources full of sample questions that you can use to practice and prepare yourself for the big day. Knowing your field inside and out, reviewing your projects, and rekindling your passion for data will go a long way toward a successful interview. Stretch and exercise now, by quizzing yourself, challenging yourself, and talking through the problems you’ve tackled — and hopefully you’ll come out the other side of the interview process with the offer you’ve been waiting on. A perpetual student, iOS aficionado, New Yorker—Melissa likes dark coffee, compelling content, and clean code.